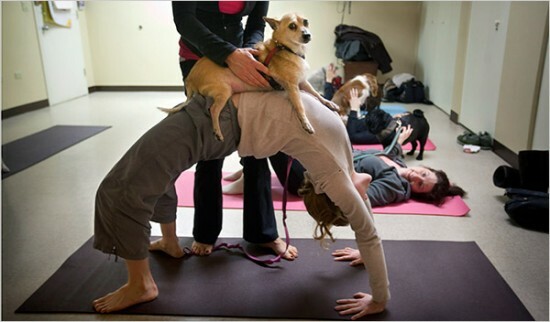 Sniffing backsides, taking naps and feasting on daily treats can apparently be pretty stressful for dogs, so in order to relax they have to take dog yoga classes, or doga. Invented by American Suzi Teitleman, who noticed her spaniel enjoyed taking part in her daily exercise routine, doga has become very popular in Asia, where owners take their pets to specialized classes like that led by renowned yoga instructor Suzette Ackerman, in Hong Kong. It’s believed dog yoga helps strengthen the bond between canine and owner, and also does wonders for their circulation, digestion and joints. Doga sessions include all kinds of poses, stretches, massages and even meditation that help both owners and pets get into tip-top shape. I’m sure it’s a pleasurable experience for yoga practicing humans, but I’m pretty sure the dogs would much rather prefer a visit to one of those luxury dog hotels, or better yet some Phydough ice-cream.